Meghan Markle, the former cable TV actress, has just pushed Queen Elizabeth II too far. Markle loves to paint herself as a leftist political activist despite the fact the Royal Family is forbidden from making political statements. 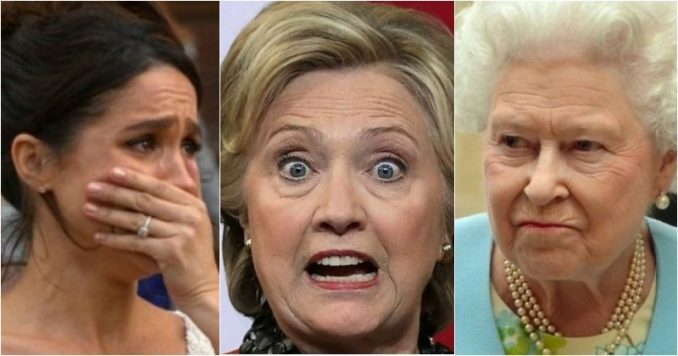 The 37-year-old decided to bring a Hillary Clinton-type nightmare right into the palace to influence everything she does, and that’s when Her Majesty had enough and delivered a “royal smackdown.” You don’t want to miss this. Meghan Markle doesn’t understand why the majority of Britons can’t stand her now that she is called the Duchess of Sussex and married to their beloved Prince Harry. Markle has been waging a personal war online using her contacts to plant favorable stories, hoping to turn the tide of all the negative press which has plagued her for some time. Even her pregnancy has been fraught with controversy with rumors she isn’t expecting and wearing a “moon-bump,” or using a surrogate, with every other imaginable strange story you can think of. Yet, the bottom line is Meghan Markle has been a disaster for the Royal Family, and it looks like she has no one to blame but herself. And if she was trying to get on the Queen’s last nerve, the 37-year-old former Suits star has done just that. The Royal Family lives and reigns at the pleasure of the British people. It’s imperative they stay out of picking a political side. They no longer rule Britain but are part of the Constitutional Monarchy who represent the Commonwealth. Queen Elizabeth II is beloved by all of Britain for her hard work to promote the Commonwealth along with the impeccable class and dignity in which she reigns. She has a duty to advise the Prime Ministers, so she must not favor one political party over another. It’s a delicate balancing act, and now Meghan Markle rides in hellbent to push her leftist agenda. And what better way for the former cable TV star to drive her leftist agenda down the throats of the English than to hire Hillary Clinton’s pit bull Sara Latham as her new Head of Communications. In fact, Latham worked for John Podesta, the sleazy chairman of Hillary Clinton’s 2016 presidential campaign. Latham was Podesta’s right-hand man and advocated for Clinton’s dirty tricks campaign. John Podesta and his brother Tony are some of the biggest players in the Washington, D.C. swamp, and Latham helped orchestrate the infamous lie to cover how four Americans were left to die in Benghazi, Libya by former Secretary of State Hillary Clinton. The palace source also explained the British Monarch recently gave the Duchess a “dressing down” over a myriad of things including the hiring of Latham and Markle’s other big move. Prince William requested last year that Meghan and Harry be given their own household after his wife Kate wanted physical distance from Meghan who she can’t stand. So, Meghan just tried to pull a fast one. The Sunday Times of London reported Meghan wanted “total royal freedom” to do her own thing away from any influence or scrutiny of Buckingham Palace. Right, Meghan doing her own thing would be a disaster. In fact, the Sussexes were banished to Frogmore Cottage, hoping to keep Meghan’s surprise performances to a minimum. The woman dubbed the “charlatan grifter” is infamous for turning up at big events in the United Kingdom which she hasn’t been scheduled to attend. Her Majesty sees that in bad taste and a little too desperate for a member of the Royal Family. Now, time will tell if this move away from London will keep the former cable TV actress out of the limelight and hopefully she will live a life befitting a minor royal. That’s probably wishful thinking with her history. But what is crystal clear is that Meghan isn’t in charge and the British people want to see much less, not more, of the Duchess of disaster.